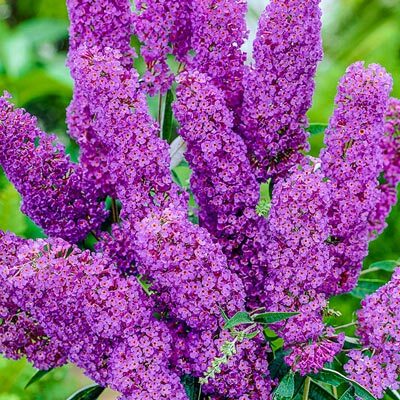 Long spike flowers-up to 8"
Winter Care: Mulch in colder climates after the ground freezes, and remove in early spring before new growth starts. Flower Form: Lilac-like, spikes up to 8" long, at branch tips only. 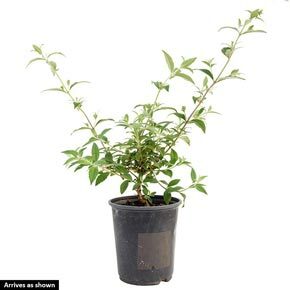 Foliage Type: Dark green, lance-shaped , pointed foliage with a tinge of silver. Pruning: Flowers are produced on new wood, so it's best to prune back near the ground (down to 12-15") in early spring before it starts producing new growth. This will keep the plant more compact. Soil Requirement: Fertile, moist, well-drained soil. Tolerates light, chalky, sandy soils.